You get a great "EVENT STAFF" T-shirt, and FREE food & drink, just like the athletes get. A triathlon is a race combining swimming, biking, and running. Distances and event order vary, but are typically in the order listed here. You will find answers to your specific questions about triathlon by searching the web for "Triathlon FAQ". How do I get there and where do I go? Who do I see when I arrive? See Lodging and Directions tab for directions to the race site. You should report to the volunteer table close to day of registration tables for all races except Nickel City Triathlon. What volunteer opportunities or positions are there? These are the positions typically available on race day (unless otherwise noted), and you may be asked to do more than one of them based on need and your availability. Some jobs take very little time, some take most of the morning. For example, if you are asked to do Body marking, you will be finished with this job before the race starts, and you might then be reassigned to the transition area or a water station. After registering, shortly before the race you will most likely receive an email telling you what time to report to the volunteer tent, and possibly what task you have been assigned. We are very accommodating and if you don´t like your assignment when you arrive on race day, we can move you somewhere else. We want you to have fun as well! How long do I have to be there? You will be assigned to a team that will perform a specific service on race day, and the time required for that team/service will vary, but will last approximately 4-6 hours. If you can't stay that long, please let us know and we will find something for you to do that will not require as much time, or organize your team such that someone will be replacing you when you have to leave. We will have volunteer needs from early in the morning through late in the afternoon, and you can stay as long as you like, we can always find more work to be done. If your team is through with it's service and you would like to help some more, check back in at the volunteer tent for a new assignment. Where will I be positioned? The majority of positions will be located by Transition, however some volunteers will be placed along the run and bike courses for water stations, safety, crowd control, and medical assistance. Will you provide water, snacks, if I will be working a long time without a break? Snacks and water, etc. will be available at the volunteer table. Volunteers in remote positions (out on the bike course for example) might be asked to take some snacks and/or refreshments with them when they are positioned on race day. Can I volunteer and do the race? You can volunteer and race. Please let us know if you intend to do so. We have volunteer needs before race day for packet stuffing and registration. You might also be able to help with the events after the race completes. What do I do if it rains on race morning? Come out anyway! The race should go on rain or shine! In the event of lightning, we will wait 30 minutes after the last lightning strike and then the race will go on. There will be a volunteer tent dedicated to all volunteer needs and check in /checkout. What if I want to volunteer then watch someone finish/start? Let your team leader know and they will arrange for you to go watch the finish. If it seems like we are done should I just take off? Let your team leader know if you are finished and would like to leave. If you would like to help out some more, check back in with the volunteer tent and we will find another assignment for you. A parking map will be posted on the web site to show which parking garage to use. 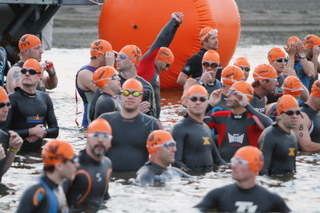 A wave start is a method used to separate the athletes into competitive groups for safety. Athletes are separated by age group and gender. The wave start order will be posted on race day. After the first group starts swimming, the second group will assemble in the water and get ready. When the gun goes off, they take off swimming and then the third group assembles and so forth.